PT Kereta Commuter Indonesia - PT KCI is a reputable mass transportation services company in Indonesia. 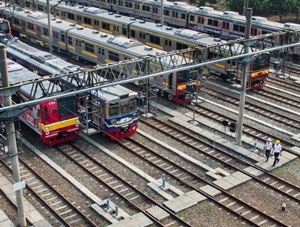 PT KCI has core business competencies in commuter railways. PT KCI operates primarily as an operator of Commuter line or KRL (Indonesian: Kereta Rel Listrik) for Electric multiple unit (EMU). PT KCI provides commuter railways transportation services in the Greater Jakarta (JABODETABEK) and its surrounding area ; Jakarta, Bogor, Depok, Tangerang and Bekasi, Banten and Cikarang. PT Kereta Commuter Indonesia was previously known as PT KAI Commuter Jabodetabek (PT KCJ), PT Kereta Commuter Indonesia is a strategic subsidiary company of state-owned railways giant PT Kereta Api Indonesia (Persero). As of December 2017, PT Kereta Commuter Indonesia is 99.80% owned by PT Kereta Api Indonesia (Persero) or known as KAI Group. Other 0.20% remaining shares was owned by Pusaka Foundation. PT KCI now has 1,450 fleets which serving 75 stations throughout JABODETABEK, Banten and Cikarang with a range of service reaches 418.5 km. According to information found in PT Kereta Api Indonesia (Persero) Annual Report 2016 as cited by JobsCDC.com, PT KCI managed to recorded a positive financial performance in the business year of 2016. PT KCI managed to record total revenue of Rp2,722.47 billion in 2017. This number is up 33.1% year-on-year (YOY) from Rp2,044.96 billion in 2016. Referring to its annual report, PT KCI reported total net profit of Rp 495,31 billion in 2017, up 71.7% from Rp288.39 billion in 2016. Minimum graduate with Bachelor of Law (S1). Accreditation study program "A" (PTS), or "B" (PTN) with a minimum GPA of 2.95 out of 4.00 grade scale. Required experience for minimum 5 years in the field of Law/Legal and occupies a position as an Assistant Manager for at least 4 years, evidenced by a certificate that has worked well, which is signed by an official at least the level of the Head of the Unit in charge of Human Resources. Good behavior as evidenced by SKCK. Not tattooed and pierced for Male. Never been sentenced to prison or confinement based on a court decision that has permanent legal force. Never been dismissed without respect as a PNS, TNI / POLRI or other institutions. Never use and / or engage in drugs / psychotropic evidence with a Certificate from the authorized agency. Not have marital relations with the employees of PT KCI. Willing to be placed in the entire work area of ​​PT KCI by signing a stamped Statement. JobsCDC.com now available on android device. Download now on Google Play here. Please be aware of recruitment fraud. The entire stage of this selection process is free of charge. PT Kereta Commuter Indonesia - Assistant Manager KAI Group April 2019 will never ask for fees or upfront payments for any purposes during the recruitment process such as transportation and accommodation.